More and more dietary supplements contain flavonoids. These products are typically viewed as food rather than drug products by regulatory agencies and therefore not subjected to rigorous clinical trials before they are marketed to the general public. As a result, the use of flavonoid-containing supplements presents a potential public health risk. From discovery to therapeutic application, this book is a comprehensive guide to both achiral and chiral flavonoids, enabling researchers to perform essential preclinical and clinical pharmacokinetics studies in order to ensure the efficacy of flavonoids marketed for therapeutic use. Moreover, the book examines the safety and toxicology of flavonoids as well as flavonoid-drug interactions. Throughout the book, the authors provide examples that demonstrate the use of pharmacokinetics concepts during the preclinical and clinical drug development process. 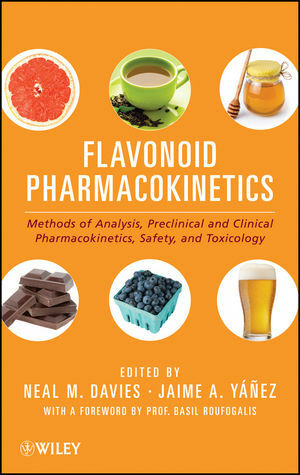 Flavonoid Pharmacokinetics is written for pharmaceutical, food, and nutritional scientists and students, offering the tools they need to thoroughly analyze and test flavonoids and flavonoid-containing supplements to ensure their safety and efficacy. Neal M. Davies, PhD. is Dean of Professor in the Faculty of Pharmacy at the University of Manitoba. He has also held faculty positions at the University of Sydney and Washington State University. Dr. Davies’s research focuses on pharmaceutics and the pharmacokinetics and pharmacodynamics of natural products. He is a graduate of the University of Alberta. Jaime A. Yáñez, PhD. is Senior Study Director in Drug Metabolism and Pharmacokinetics at Alcon Research, Ltd., a Novartis Company. Previously, he worked at Schering-Plough Research Institute and Merck Research Laboratories. He also serves as Adjunct Faculty and Research Consultant at Universities and research organizations in Peru, Mexico, Spain and the United States. Dr. Yáñez’s expertise spans preclinical and clinical pharmacokinetics, pharmacodynamics, pharmaceutics, and predictive computer modeling and simulation, all with an emphasis on natural products.